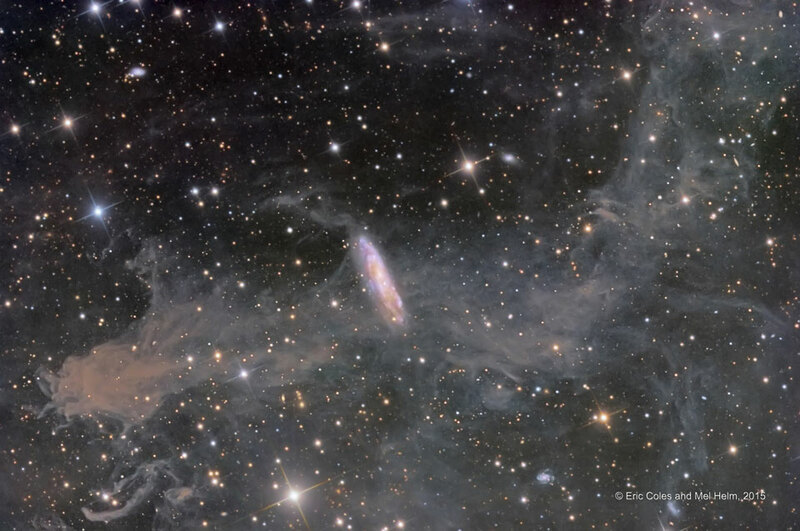 What you see is the constellation of Pegasus and, most beautiful, all the cosmic dust cataloged as The MBM 54. Under this beautiful image what we observe is called molecular clouds of cosmic dust that, you will ask what they are. Molecular clouds are called a type of high-density cosmic dust (we go, very dense shell-shaped dust) that allows the creation of dihydrogen molecules. That is, they are zones of high density of hydrogen dust that is combined by gravity to form dihydrogen. Dihydrogen is a great foundation for star creation. Gravity “joins” the dihydrogen to high pressures turns it into liquid being, this, the element that forms the nucleus of these. That’s why it is thought that molecular clouds are the precursors of stars and where there are such clouds is thought to be a hatchery of stars. Molecular clouds should not be confused with cosmic dust or gas clouds since the former have a higher density first, and secondly, dust or gas clouds may be formed of other elements both light and heavy such Such as nitrogen, carbon, oxygen, silicon, heavy metals (such as aluminum, iron …) or any kind of small molecules. The cosmic dust is the main former of planets and their content (for example, us) and its origin is usually the outer layers of stars or explosions of supernovae (among others). In short, expelled coronary mass, which is where the heavy molecules are. So we can think that the molecular clouds are different but of the cosmic dust and that they differ in their density and composition, mainly.